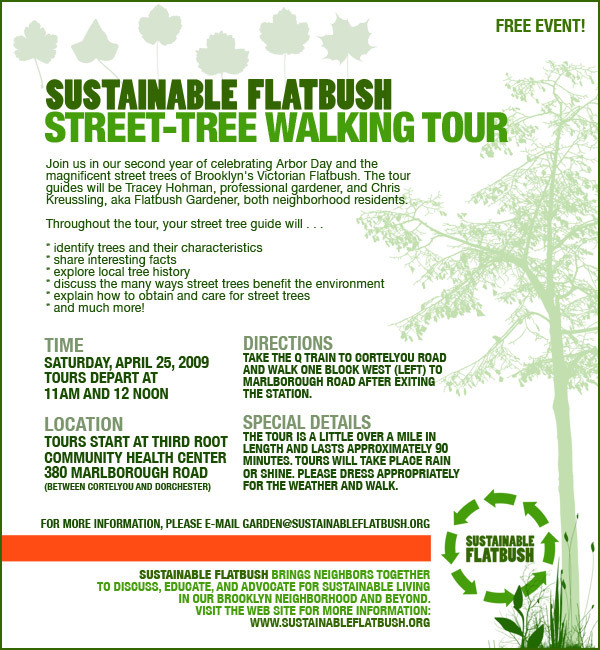 Browse: Home /	LIVABLE STREETS, Public Places, Sustainable Flatbush News / Street Tree Walking Tour, Saturday 4/25/09! Street-Tree Walking Tour this Saturday, April 25th! Join us in our second year of celebrating Arbor Day and the magnificent street trees of Brooklyn’s Victorian Flatbush. The tour guides will be Tracey Hohman, professional gardener, and Chris Kreussling, aka Flatbush Gardener, both neighborhood residents. Marlborough Road after exiting the station. The tour is a little over a mile in length and lasts approximately 90 minutes. Tours will take place rain or shine. Please dress appropriately for the weather and walk. I live near a place called Aston on Clun, in the UK. Strangely, the village also has an Arbor day celebration. Apparently it was a regular festival 300 years ago, but now there is just the one in the UK. Don’t know if it’s the same, but it involves a tree..
What a super idea for a tour! Nowadays I’m finding more and more people who have little appreciation for urban trees – complaining about roots damaging the sidewalks, the work in picking up after them, or the potential “danger” from falling branches. After having gorgeous old trees cut down by neighbors on two occasions for reasons like these I’ve become so sensitive I leap out of bed in the morning thinking that any power tool is the sound of a saw bringing down another tree. I’m going to think about the possibilities of doing a tour like this in my area. Trees need our support!